By modifying a famous experiment involving a person in a gorilla suit and two teams of people passing basketballs back and forth, Simons demonstrated that expecting the unexpected does not improve one's chances of seeing it. Photos provided by Daniel Simons. Photo illustration by Diana Yates. CHAMPAIGN, lll. - A new study finds that those who know that an unexpected event is likely to occur are no better at noticing other unexpected events - and may be even worse - than those who aren't expecting the unexpected. 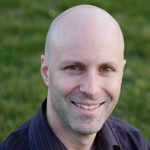 University of Illinois psychology professor Daniel Simons (pictured) is co-author, with Union College psychology professor Christopher Chabris, of "The Invisible Gorilla, And Other Ways Our Intuitions Deceive Us." The study, from Daniel Simons, a professor of psychology and an affiliate of the Beckman Institute at the University of Illinois, appears this month as the inaugural paper in the new open access journal i-Perception. Simons and Chabris found that many of those who viewed the video failed to notice when a person in a gorilla suit walked into the game, faced the camera, pounded on its chest and then sauntered out of view. The gorilla was on screen for nearly nine seconds, yet half of those who watched the video didn't see it. This finding was a particularly dramatic example of "inattentional blindness," the failure to see something obvious when focusing attention on something else. Simons wanted to see if those who knew about the gorilla before viewing the video would be more or less likely to notice other unexpected events in the same video. "You can make two competing predictions," Simons said. "Knowing about the invisible gorilla might increase your chances of noticing other unexpected events because you know that the task tests whether people spot unexpected events. You might look for other events because you know that the experimenter is up to something." Alternatively, "knowing about the gorilla might lead viewers to look for gorillas exclusively, and when they find one, they might fail to notice anything else out of the ordinary." As in the earlier experiment, of those who had never seen or heard about the gorilla video, about half missed the gorilla in the new video. Those who knew about the original gorilla video all spotted the gorilla in this experiment. However, knowing about the gorilla beforehand did not improve the detection of other unexpected events. Only 17 percent of those who were familiar with the original gorilla video noticed one or both of the other unexpected events, while 29 percent of those who were unfamiliar with the original gorilla video spotted one of the other events. This difference between the "familiar" and "unfamiliar" viewers of the video is not statistically significant, Simons said, but the study does demonstrate that being primed to the possibility of unexpected events does not enhance one's ability to notice other unexpected events. "The main finding is that knowing that unexpected events might occur doesn't prevent you from missing unexpected events," Simons said. "People who are familiar with the purpose and conclusions of the original study - that people can miss obvious events when focused on something else - still miss other obvious events in exactly that same context. Even when they know that the experimenter is going to fool them, they can miss something that's obvious, something that they could spot perfectly well if they knew it was there." 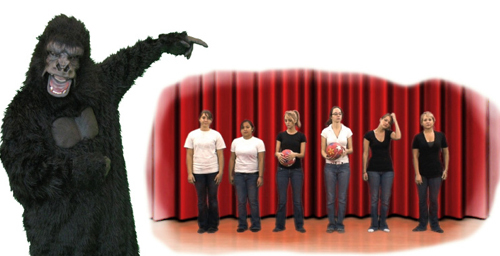 The video itself, called "The Monkey Business Illusion," was a finalist in the Neural Correlate Society's Best Illusion of the Year contest in May, where Simons donned a gorilla suit and presented the new video himself. (You can view his presentation yourself.) Most of the vision scientists in the audience knew about the original gorilla video, and yet most still missed one or both of the other unexpected events in the video. Editor's note: To contact Daniel Simons, call: 217-333-7628; e-mail: dsimons@illinois.edu. The paper, “Monkeying Around With the Gorillas in Our Midst: Familiarity With an Inattentional-Blindness Task Does Not Improve the Detection of Unexpected Events,” is available online.